Mimi is a beautiful girl from Bridgett's first litter with the handsome Ch. Honeyfox Brandy Alexander CDX RAE OA OAJ NF CGC. Mimi is flashy with a great temperament. And she does think it's all about "her" (hence her name, Mimi). 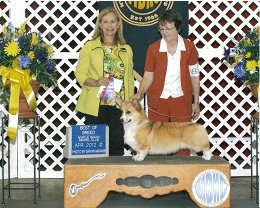 With expert handling by Ferebe Simons, Mimi had stunning wins and is Grand Champion! 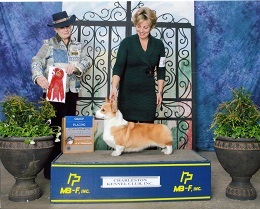 AND her first show as a special, Mimi went Group 2 under Judge Terry M. DePietro at the Charleston Kennel Club show on Jan. 26, 2014! Way to go Ferebe and Mimi! Thank you Judge DePietro for G2! Bella is another beautiful girl from Bridgett's second litter with the handsome GCH Carterhall Captain Crunch CGC. She had all of the signs for a sable when she was a little puppy, so we played with the word "sable" to come up with her registered name. Time will tell if she is a sable. Bella's first time in the ring--at 6 mos. old!--she went Best of Breed! Way to go Ferebe and Bella! Charlotte is Bella's littermate from Bridgett's second litter with the handsome GCH Carterhall Captain Crunch CGC. Charlotte is maturing slower than Bella so we were surprised that Charlotte took Group 2 Puppy Herding in Pinehurst. She is incredibly sweet and we love her eye contact! Bridgett is an awesome smart, sweet girl. She has amazing eye contact and is a real character. Great bones and movement. She has great potential and has won Best of Breed. Taking a break from showing, Bridgett outdid herself with a gorgeous litter on Nov. 14th. Check them all out on Our Wee Ones page! 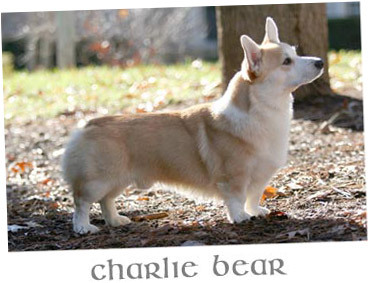 Some have called her an old fashioned looking Corgi. 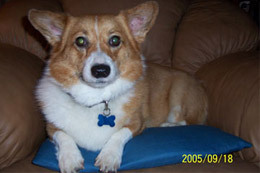 She joined our family as a puppy pet, and she was spayed when she was six months old.